BRENDAN RODGERS SAYS Celtic want to keep Moussa Dembele and have held talks with the striker over his future. Ligue 1 clubs Marseille and Lyon are both interested in signing Dembele ahead of Friday’s transfer deadline. Dembele was linked with a move to the Premier League in January but Brighton and Hove Albion boss Chris Hughton dismissed speculation linking the player with his club. 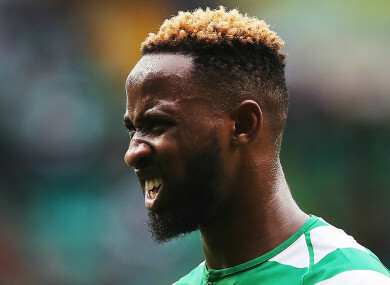 While Dembele is available for Thursday’s Europa League play-off against Suduva, the striker’s long-term Celtic future is uncertain. “There’s a lot going on with Moussa at the moment,” Rodgers told reporters on Wednesday. ”Moussa and his representatives were at the club today speaking with the club. There is speculation around him. Moussa is not a player we want to lose. It is ongoing discussions. There hasn’t been an official bid as far as I am aware, but interest. “He’s a phenomenal talent but he’s not going to be here forever. Like a lot of the European boys, they develop at a great club and look to move on. Lyon president Jean-Michel Aulas confirmed his club’s interest in Dembele at a news conference, with the 22-year-old targeted as a replacement for Mariano Diaz, who is set to rejoin former club Real Madrid after a mooted move to fellow LaLiga club Sevilla fell through. “We cannot announce the replacement of Mariano yet. His arrival and the departure of Mariano will be connected,” Aulas said. “Moussa Dembele is a target, yes. But I also read that Marseille were on it. Is it harder for them than for us? Yes, I think so. Email “Celtic in talks over Dembele future amid Ligue 1 interest, Rodgers confirms”. Feedback on “Celtic in talks over Dembele future amid Ligue 1 interest, Rodgers confirms”.